I love Halloween. 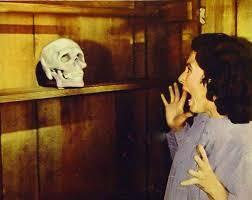 I decorate every room in my house and fill my yard with skeletons, gravestones, and disembodied heads. I am the only one in my neighborhood who does it. I know I’m not the only one in the world though. Many adults with kids get a kick out of Halloween. They love seeing the cute costumes and the reaction of their children to spooky decorations. Well, my kid is seventeen now and I’m still doing it. For years I made her costumes and helped her make invitations to her yearly Halloween party. Did I do it because I’m a good mom? Possibly. I think it might also be that I love making skull cookies and punch with an ice hand floating in it. I love using toilet paper dowels and glow sticks to fill my bushes with glowing eyes. I also love horror movies. I’m a big fan of psychological and atmospheric horror, but I welcome gore as well. 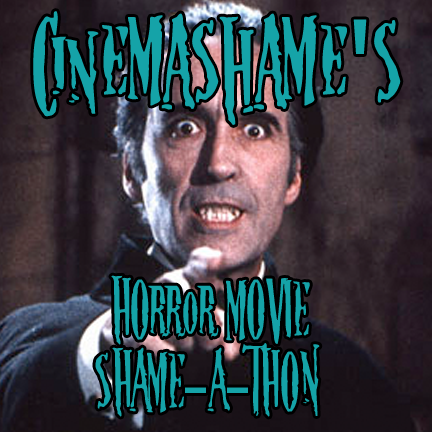 Since I’m planning to watch some horror films I’ve never seen before, I’ll post on cinemashame.wordpress.com and my own blog prowlerneedsajump.wordpress.com throughout the month. I’ll admit there are a few on this list I’ve always wanted to see and a few I just haven’t seen. I thought I’d throw them on this list for fun. For instance, I’ve wanted to see Suspiria, Black Sunday, and The Innocents for ages. The Slime People, not so much. That’s ok. I have to lighten it up too. Since it’s 31 Days of Horror and not 22 Days of Horror and 9 Days of Annoyance, here are the other 9 films I plan to watch. I’ve seen these before, but they fit the parameters. Boo. 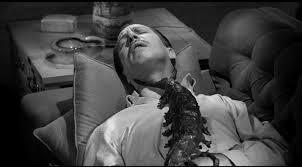 This entry was posted in @echidnabot and tagged 31 Days of Horror by campbelldropout. Bookmark the permalink.